When David Alfredson was diagnosed with Parkinson’s disease in May 2015, he was left with more questions than answers. A friend’s suggestion, however, led him to the OSF Center for Health – State Street, where he learned how to fight back against the effects of the disease. After an evaluation, the now-72-year-old David, of Loves Park, Illinois, began the Lee Silverman Voice Technique, or LVST BIG program, in August 2015. David learned the exercises needed to maintain his motor functions as long as possible. Parkinson’s isn’t curable, but patients can take action to slow it down. David Alfredson is right at home in his woodshop. For four weeks, David worked with Candice Ackerman, an OSF HealthCare physical therapist, who used some tough love to get David on the right track. David continues to do his LSVT BIG exercises at home almost daily. When an emergency surgery in July 2017 sidelined him for eight weeks, he regressed significantly. He could maybe lift eight pounds of weight with his arms. However, through hard work, he regained most of the ground he lost by November. “If I hadn’t been doing it, I’d probably be a lump in a chair not moving at all,” David said. With help from his exercises, David is able to enjoy retirement and do the things he likes, like woodworking. 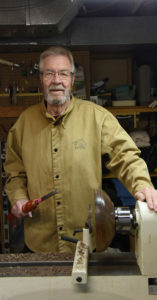 He even recently got a small lathe, and has taken up woodturning, making small things like bowls and unique pens. David also completed the LSVT LOUD program, which uses exercises to help Parkinson’s patients speak clearly and project their voice.